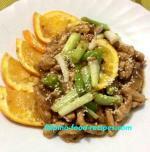 Pininyahang Manok is a very simple dish yet very tasty and easy to make. It is cooked just like the Chicken Pastel and rich tasting like Chicken Sopas but with pineapple and creamy just like the Chicken curry. It is made with chicken, carrots, potatoes, bell pepper and milk, with the addition of the pineapple which is a good source of fiber. 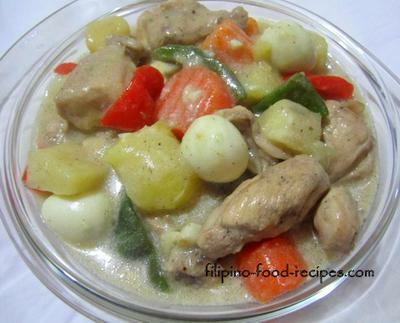 Other variations of the Pininyahang Manok use coconut cream instead of milk, or all-purpose cream (nestle cream). The recipe here uses evaporated filled milk which is definitely cheaper but tastes just as good. 1. Saute onion and garlic. 2. Add the chicken pieces and cook until slightly brown. 3. Stir in the fish sauce, sugar and the syrup from pineapple tidbits. 4. Add the potatoes, carrots and water and cook for 10 minutes. 5. Mix in the bell peppers, milk and pineapple tidbits and simmer until the chicken and potatoes are tender, and the sauce has thickened, for about 15-20 minutes. 6. Season with some salt and pepper to taste. (Note : You could add quail eggs if you prefer).